I just read the debut issue for the new Black Mask series “The Skeptics” and was quite pleased with this sweet little intro to a thus far promising retro adventure. Brought to you by Tini Howard and Devaki Neogi we’ve got a solid story of two teenagers during the Cold War era that are brought in by the US government to test for paranormal abilities. There’s a claim made by the Soviets that they’ve got a new breed of soldier in the works, ones with intense psychic abilities. But is it just a hoax to scare us Americans during those tense times? Either way it doesn’t matter because of course the US is determined to find people with similar unique abilities here in our own country to face off with the Soviets. Well all just is not what it seems when Mary and Maxwell are brought in for testing, for unknown reasons these two have figured out a way to to trick the scientists and even the President into believing they’ve got telekinetic abilities. The President claims they’re the key to stopping World War 3 but it seems there’s more going on than meets the eye. The two young “psychics” quickly decide to take matters into their own hands when they realize that perhaps it’s not a hoax. The Soviets may indeed be harboring people with superhuman abilities. I had a pretty fun time with the first issue, it’s really simplistic, pure story telling with some decent artwork as well. It’s a refreshing break from all of the ultra edgy stuff being cranked out these days, I’ll check out issue number two and see just where this all goes but either way the debut is worth a look if you’re looking for something a little different. Here’s another decent debut issue that finds it’s plot ripped from the media headlines. 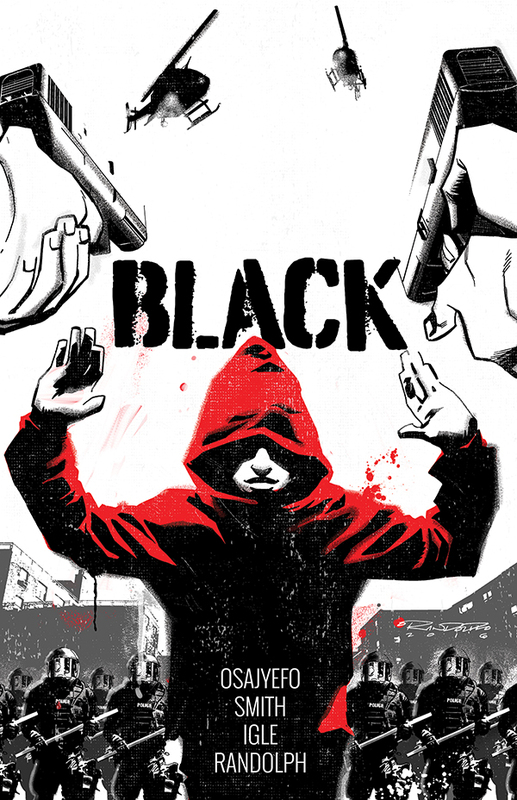 It’s a story about police corruption and racism in America with a superhero twist. We’ve got corrupt white cops who shoot down three black teens who’ve done nothing wrong in broad daylight on the streets of the inner city. Sound familiar? 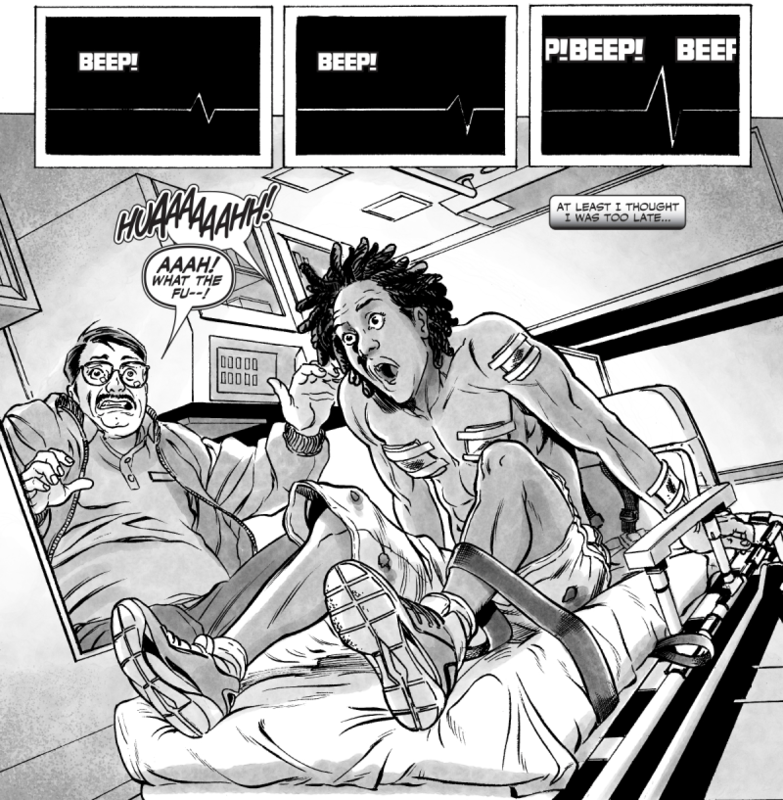 Well things get more interesting when one of the teens who’s presumed dead awakens alive and well in the ambulance on the way to the hospital with seemingly superhuman energy and endurance. On the run from the cops he meets a Morpheus like character (from the movie The Matrix) who helps him to safety and soon it’s revealed that people do indeed exist on this planet with superhuman powers….except only those who are black can have them. This like The Skeptics is also a pretty quick and simple read with an interesting spin on the superhero genre. This idea spun out of a Kickstarter campaign and was soon picked up by Black Mask. The art adds to the experience as it’s really well drawn and in black and white. The writing for this by Kwanza Osajyefo is solid yet at the same time a bit on the predictable side. Starting out with a fairly popular view point being, corrupt cops are running rampant and they kill black people for no apparent reason. I think it’s fair to say from most of the news stories we’ve heard reported on point to this similar scenario. So we’ve definitely got a story here thats basis is controversial and hotly debated. I can already see people being upset about the race issue presented here, it is indeed written to get a response from white readers and continue the much needed dialogue about racial tension today. I think however it’s not much really of a different concept than say “Y The Last Man” yet this comic’s timing probably is the most controversial aspect of it.